One important symptom of patients with major depressive disorder (MDD) is memory dysfunction. However, little is known about the relationship between memory performance and depression severity, about the course of memory performance during antidepressant treatment as well as about the relationship between memory performance and brain-derived neurotrophic factor (BDNF). 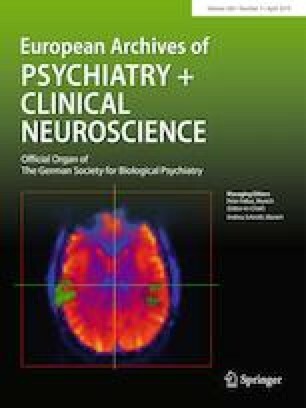 Memory function [learning and delayed recall) was assessed in 173 MDD patients (mean age 39.7 ± 11.3 years] treated by a pre-defined treatment algorithm within the early medication change (EMC) study at baseline, days 28 and 56. Depression severity was assessed in weekly intervals, BDNF plasma levels were measured at baseline, days 14 and 56, BDNF exon IV and p11 methylation status at baseline. Linear mixed regression models revealed that the course of depression severity was not associated with the course of learning or delayed recall in the total group. 63 (36%) of the investigated patients showed memory deficits (percent range ≤ 16) at baseline. Of those, 26(41%) patients experienced a normalization of their memory deficits during treatment. Patients with a normalization of their delayed recall performance had significantly higher plasma BDNF levels (p = 0.040) from baseline to day 56 than patients with persistent deficits. Baseline BDNF exon IV promoter and p11 gene methylation status were not associated with memory performance. Our results corroborate a concomitant amelioration of learning and delayed recall dysfunctions with successful antidepressant therapy in a subgroup of patients and support a role of BDNF in the neural mechanisms underlying the normalization of memory dysfunctions in MDD. ClinicalTrials.gov number: NCT00974155; EudraCT: 2008-008280-96. Jan Engelmann and Stefanie Wagner equally contributed to the manuscript. The online version of this article ( https://doi.org/10.1007/s00406-019-01006-z) contains supplementary material, which is available to authorized users. The authors are grateful to the members of the EMC Study Group, who were involved in the acquisition of data for this additional scientific investigation. These members are: Univ.-Prof. Dr. Klaus Lieb, PD Dr. André Tadić, Univ.-Prof. Christoph Hiemke, Dr. Nadine Dreimüller, Dr. Ömür Baskaya, Dr. Danuta Krannich, Dr. Sonja Lorenz, Annette Bernius, Dr. Tillmann Weichert, Dr. Markus Lorscheider, Dr. Martin Kloß, Dr. Dipl.-Psych. Isabella Helmreich, Dipl.-Psych. Karen Grüllich, Elnaz Ostad Haji, Yvonne Lober, Danuta Weichert, Dr. Konrad Schlicht, Dr. Christina Weigert, Dr. Jana Maurer (Department of Psychiatry and Psychotherapy, University Medical Centre Mainz); Dr. Konstantin Mayer (Sana Klinikum Offenbach, 65346 Offenbach, Germany); Prof. Dr. Dieter F. Braus, Dr. Julia Reiff, Dr. Christoph Kindler, Dr. Svenja Davis, Dr. Claudia Ginap, Dipl.-Psych. Julia Kraus, Dipl.-Psych. Sabine Kaaden, Dr. Dipl.-Psych. Jelena Janzen, Dipl.-Psych. Nina Löffler, Caterina Topaloglu, Elitza Klutscher (Clinic for Psychiatry and Psychotherapy, Wiesbaden). The EMC trial was funded by the German Federal Ministry for Education and Research (BMBF Grant no. : 01 KG 0906; applicants: KL, AT, CH, ND, KK); the herein presented additional investigations are not part of the funding. The BMBF had no role in the conception of the study design, in the writing of the manuscript or the decision to submit the manuscript for publication. PD Dr. André Tadic is designated as inventor of the European patent number 12171541.1–2404 ‘Method for predicting response or non-response to a mono-aminergic antidepressant’. He has received in the last five years consultancy fees from Janssen and Novartis. Prof. Dr. Klaus Lieb is designated as inventor of the European patent number 12171541.1-2404 ‘Method for predicting response or non-response to a mono-aminergic antidepressant’. Prof. Dr. Dieter F. Braus has received in the last 5 years fees for unrestricted educational lectures from Lilly, Janssen, Bayer, Lundbeck, Servier, Shire, TAD Pharma. None of the authors (JE, SW, DW, SK, KFS, ND, MM, OT) has relevant financial interests in this manuscript. All patients gave their written informed consent to participate in the study after a complete and extensive description. All study components were approved by the local ethical committee of the Landesärztekammer Rheinland-Pfalz [study code no. 837.166.09 (6671)] and are compliant with the Code of Ethics of the World Medical Association (Declaration of Helsinki) in its current version.